Insurgent is now showing in cinemas everywhere and is distributed in Australia by Entertainment One. 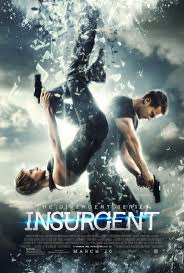 Insurgent is a fine follow up to it's predecessor, Divergent (2014). After escaping from Erudite's ruthless leader, Jeanine (Kate Winslet), Tris (Shailene Woodley), Four (Theo James), Caleb (Ansel Elgort) and Peter (Miles Teller) are hiding out with the members of the faction Amity as fugitives while they decide what their next move against Jeanine is. A twist of fate results in three of them encountering and lodging with the factionless, a group much bigger and better equipped than they ever thought possible who are led by Evelyn (Naomi Watts). Tris finds that Evelyn is just as keen to declare war on Jeanine, but first she has to battle her own demons and make peace with herself for how her and her Divergence have impacted the lives of those around her. As the second film in the series based on Veronica Roth's novels, Insurgent is just as action packed and thrilling as the first film. The story continues without a lapse in momentum as it wastes no time in restarting the intensity experienced in the first film and reacquainting the audience with the characters. The film does not for one moment allow itself to settle and there are no moments of tedium as there is continuous suspense and unpredictability for those who haven't read the books. 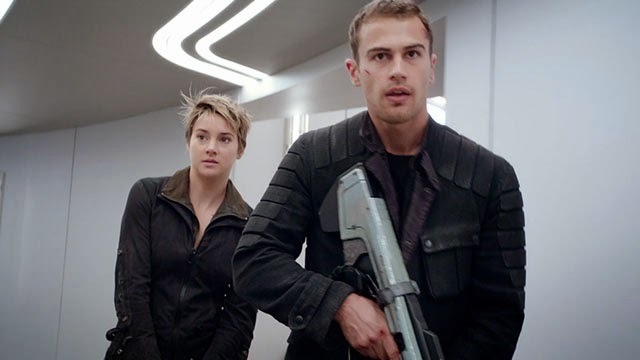 Insurgent is exceptionally strong for what it is and that is a second film. As a first, final or stand alone film it wouldn't be of substantial quality, but it is a well done second film. Again like the first film, Insurgent's production design is extremely impressive. The city turned wasteland is visually intriguing and extremely detailed. The musical score is a perfect fit for the overall suspenseful atmosphere of the film and adds to the intensity of the story. The CGI for the most part of the film is fine, but towards the end of the film starts to look purely computer generated and not realistic, which is never what viewers want to think even when they are well aware of what is computer generated. One has a hard time taking the final scenes in which Tris is at a height seriously as the unrealistic feel of some of the images is so distracting. The characters themselves are really quite stereotypical of the young adult novel series turned film trend that is prevalent in cinema of this day and age. However, as a result of the cast being so good in their roles the normality of their characters is both forgiven and forgotten. We have the ballsy female protagonist, the male hero, the smart mouth and the bad guy, all typical characters but well portrayed by Shailene Woodley, Theo James, Miles Teller and Jai Courtney. Each brings a great deal to their character while not overplaying the less than original character traits. The Divergent series of films are extremely well cast for this reason. Woodley once again proves her ability as a leading lady and shows so much strength in every scene throughout the film. However, Kate Winslet's Jeanine has the opposite effect. Her character is full of normality and it isn't her acting that overdoes the character, it is the accompanying cinematography (particularly towards the end) that makes her evil characteristics laughable. Naomi Watts' Evelyn is an enigma, but not a tremendously exciting one. She does not come into intrigue until the final moments of the film and even then she does not show any particularly interesting character traits. What one is left with at the end of Insurgent (unless they have read the complete series of books) is a loss as to where the last two films are going. The moment that can be described as the cliff hanger doesn't give away enough to make one really excited about the next film. Therefore as strong as the rest of the film is, the finale arrives and with it delivers a sense of indifference for the next film. Insurgent is a strong follow up to Divergent and a fine film in it's own identity, but unfortunately doesn't provoke a sense of excitement for the next two films.